“You are what you eat.” Right now, there are probably countless moms and dads all around the world encouraging someone they care about to eat a healthier diet. The truth of that old saying applies every bit as much to your eyes as it does to any other part of your body. Your eyes require many different vitamins and minerals, but the nutrients below are among the most important. Many foods contain multiple goodies. A well-balanced diet will supply much of what you need, but supplements can be helpful in ensuring your eyes receive what they need every day. You may have seen lutein, probably with zeaxanthin, in the supplements section at your local pharmacy or grocery store. You might find it listed among the ingredients on a multivitamin, especially those for seniors (although the dosage may be very low). Lutein and zeaxanthin are very important nutrients for your eyes. Over the years, there have been many studies on the link between lutein and zeaxanthin and chronic eye diseases. 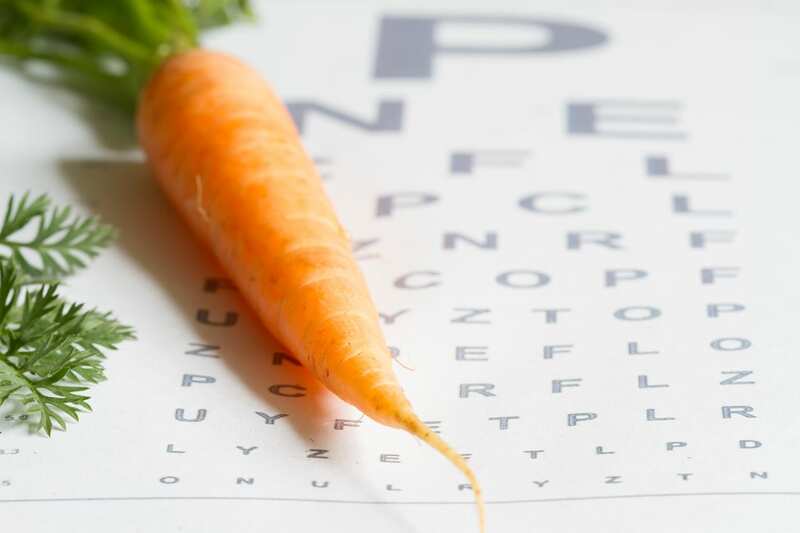 The bottom line is that lutein and zeaxanthin are important in helping preserve your vision, especially as you get older, by reducing the risk of cataracts and age-related macular degeneration (AMD). Studies found that a low level of those critical nutrients was linked to AMD. Further research is ongoing, but the importance of these nutrients seems clear. Because of the importance of lutein and zeaxanthin, you should ask your eye doctor if you should also take a lutein/zeaxanthin supplement in addition to eating lutein-rich foods. Vitamin C or ascorbic acid is one of the most widely-used vitamins. You might use it to help against a cold, but vitamin C is an antioxidant that’s also good for the heart, immune system and even your skin. Vitamin C is also necessary for your eyes. Research suggests it reduces the risk of cataracts and helps to reduce vision loss associated with AMD by slowing the progression of the disease. The health of your eyes can be affected by factors that may not seem relevant but have an effect. Smoking, the use of steroids and diabetes all deplete the vitamin C needed by the eye’s lens. Vitamin C is also necessary for maintaining the health of blood vessels within the eye. Antioxidants are necessary for bodily health and vitamin E is one of the most powerful. Vitamin E isn’t just one vitamin, but a combination of fat-soluble vitamins working together to combat free radicals. Many studies have linked free radicals (electrons that split from atoms within the body and break down healthy tissue) to multiple health problems including heart issues, cancer and premature aging. In the eye, vitamin E offers similar protection by protecting cells from free radicals. Cataracts are believed to form as a result of the sun’s UV rays causing oxidation within the lens of the eye. As a strong antioxidant, vitamin E helps fight oxidation damage. Since UV rays are so damaging to the eyes, check out our blogs UV Protection: Which Lenses Are Best and What happens to the Eye Without UV Protection?. While many people restrict fats in their diet, a certain amount of the right fats are necessary. These essential omega-3 fatty acids help support the immune system, provide energy to the cells and are essential for the nervous system. In the eyes, omega-3s have several critical functions. Omega-3 fatty acids are necessary for the retina and visual development. Research suggests that these fatty acids also provide some protection against dry eye syndrome and macular degeneration. Omega-3s may also help decrease high eye pressure, sometimes associated with glaucoma. Zinc is one of the essential trace minerals required by the body, carrying vitamin A to the retina from the liver where it helps produce melanin, a protective pigment against UV damage. A zinc deficiency is also associated with poor night vision and cataracts. You shouldn’t have any trouble remembering which specific foods are bad for your eyes. A study conducted at the Massachusetts Eye and Ear Infirmary added more fuel to the “junk foods are bad for you” fire. The fats commonly associated with processed junk foods are linked to a higher risk of age-related macular degeneration (AMD). This terrible, incurable eye disease is the leading cause of deteriorating vision and blindness among U.S. seniors. In other words, all those packaged cookies, pies, cakes, snacks, fried foods, margarine and many other overly processed junk foods contain unhealthy fats. If you know a food isn’t good for your overall health, it’s very likely just as bad for your eyes as it is for your heart and your waistline. Carrots would be at the top of most people’s “best food for your eyes” list. Other foods, however, are equally wonderful for eye health. One or two may surprise you. Many orange and red foods are high in Vitamins C and E, both great antioxidants. These brightly-colored foods may also contain eye-healthy lutein and zeaxanthin, beta carotene and/or zinc. Orange and red bell peppers are very high in Vitamin C. Since cooking heat breaks down Vitamin C, you obtain the most benefit from raw peppers and other Vitamin C fruits and veggies. Squash supplies lutein and zeaxanthin. Summer squash also has Vitamin C and zinc while winter squash also supplies Vitamins A and C plus omega-2 fatty acids. Make a point of upping your consumption of spinach, kale and collards. They’re rich sources of Vitamins C and E, lutein and zeaxanthin. They also supply plant-based Vitamin A which helps reduce the risk of cataracts and AMD. Both veggies are packed with antioxidants your eyes need: lutein, zeaxanthin, beta-carotene and Vitamins C and E. You’re probably familiar with the link between free radicals and heart disease. Free radicals also attack your retinas. Your retinas require both DHA and EPA omega-3 fatty acids. If you’re prone to dry eyes, this may indicate you have a low level of these essential nutrients. Oysters are the all-around best source of zinc, but beef, pork and both dark and light poultry meat are also good sources of zinc. Chickpeas, kidney beans, lentils, black-eyes peas and even canned baked beans are low-fat sources of both zinc and fiber. Eggs are rich in eye-healthy nutrients: Lutein, zeaxanthin, Vitamins C and E and zinc. If you are following a diet which limits eggs, for example, there are plenty of other delicious choices for an eye-healthy diet. All you really have to do is avoid junk foods and eat healthy snacks instead. Choose lean meats, poultry and fish rich in omega-3s. Select colorful fruits and veggies and eat them raw whenever possible. Your eyes will thank you! Water is essential throughout the body. If you’re troubled with dry eyes, you could be dehydrated. Since 1981, Florida Eye Specialists and Cataract Institute has been the leading eye care and surgery center on Florida’s west coast. Florida Eye combines the most advanced technologies with warm, personalized service, all dedicated to the eye health of each and every patient. To learn more or schedule an appointment, contact the Florida Eye Specialists and Cataract Institute online or call 813-681-1122.